An antibody, or immunoglobulin, is a Y- shaped protein used by the immune system to identify and neutralize foreign pathogens, like bacteria, parasites, and viruses. The terms antibody and immunoglobulin generally are used interchangeably. The immune system can recognize and defend against a great number and diversity of invading organisms. Indeed, the immune system is capable of recognizing millions of molecular features, and when working properly differentiates between foreign invaders, which are to be neutralized, and parts of the body, which should not be attacked. Antibodies are found on the surface of B cells (short for B-lymphocytes—a type of white blood cell). B cells and T cells (short for T-lymphocytes) play the key roles in the immune system, with B cells involved in the antibody component. 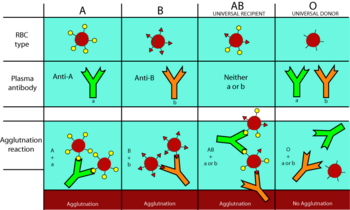 B cells manufacture, secrete, and present antibodies, with each type of B cell producing a unique antibody. Each antibody recognizes and binds to a specific antigen (which is any substance that stimulates an immune response from the body, and which can then react with products of that response). The B cell circulates through the blood and lymph, and when that specific antigen is detected, the antibody is multiplied to bind with the antigen. The antibody-based immune system represents a stunning harmony between an antigen and the antibody that is produced for that specific antigen. As well, it reflects the principle of dual purposes, whereby an antibody's individual purpose harmonizes with the higher purpose of neutralizing foreign invaders and protection of the body, sacrificing itself in the fulfillment of that task. All jawed vertebrates (Gnathostomata) have an antibody-based immune system (Zimmer 2004), including Chondrichthyes (sharks, rays), Osteichthyes (bony fish), amphibians, reptiles, birds, and mammals. Invertebrates and jawless vertebrates (Agnatha) lack such a system. Thus, lampreys, hagfish, and insects lack antibodies, but whales, rabbits, and humans have such a system. Production of antibodies and associated processes are referred to as the humoral immune system. The humoral immune response is one of two main mechanisms of the immune system; the other being the cell-mediated immune system, involving T cells. Immunoglobulins, or antibodies, are glycoproteins in the immunoglobulin superfamily that function as antibodies. They are found in the blood, tissue fluids, and in many secretions. Structurally, immunoglobulins are globulins and are found in the γ-region of protein electrophoresis. Antibodies actually are synthesized and secreted by plasma cells that are derived from the B cells of the immune system. B cells are activated upon binding to their specific antigen and multiply and transform into plasma cells. In some cases, the interaction of the B cell with a T helper cell is also necessary. They combine with different immunoglobulin receptors specific for them and exert effector functions. These receptors are isotype-specific, which gives great flexibility to the immune system, because different situations require only certain immune mechanisms to respond to antigens. The humoral immune response is a type of acquired immunity that is directed at specific invaders (Silverthorn 2004). At first exposure to a pathogen, the body's response may take several days. However, upon repeated exposures the response is more rapid. The humoral immune response has several steps that culminate in the use of antibodies, which are present in the blood. When a macrophage (white blood cell that ingests and destroys invaders) ingests a pathogen, it attaches parts of the pathogen's proteins to a major histocompatibility complex class II protein, or for short 'MHC II. This complex is moved to the outside of the cell membrane, where it can be recognized by a T cell, which compares it to similar structures on the cell membrane of B cells. If it finds a matching pair, the helper T cell activates the B cell, which starts producing antibodies. A B cell can produce antibodies only against the structure it presents on its surface. Antibodies exist freely in the bloodstream or bound to cell membranes. They exist in clonal lines that are specific to only one antigen, e.g., a virus hull protein. In binding to such antigens, they can cause agglutination (clumping of cells) and precipitation of antibody-antigen products primed for phagocytosis by macrophages and other cells, block viral receptors, and stimulate other immune responses, such as the complement pathway. Antibodies that recognize viruses can block these directly by their sheer size. The virus will be unable to dock to a cell and infect it, hindered by the antibody. They can also agglutinate viruses so phagocytes can capture them. Antibodies that recognize bacteria mark them for ingestion by phagocytes, a process called opsonization. Together with the plasma component complement, antibodies can kill bacteria directly. They neutralize toxins by binding with them. It is important to note that antibodies cannot attack pathogens within cells, and certain viruses "hide" inside cells (as part of the lysogenic cycle) for long periods of time to avoid them. This is the reason for the chronic nature of many minor skin diseases, such as cold sores. Any given outbreak is quickly suppressed by the immune system, but the infection is never truly eradicated because some cells retain viruses that will resume the apparent symptoms at a later time. Antibodies present in blood determine a person's blood type. This is just a schematic. In reality, the antibodies are larger, polymeric molecules (IgM), generally pentamers with ten binding sites. Immunoglobulins are heavy plasma proteins, often with added sugar chains on N-terminal (all antibodies) and occasionally O-terminal (IgA1 and IgD) amino acid residues. The basic unit of an antibody is a monomer (a small molecule that may become chemically bonded to other monomers to form a polymer). 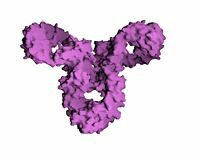 An antibody monomer is a "Y"-shape molecule that consists of two identical heavy chains and two identical light chains, which are connected by disulfide bonds. A hinge region exists between the arms and the stem of the Y shaped monomer, which allows flexible positioning of the arms. An antibody can be monomeric, dimeric, trimeric, tetrameric, pentameric, and so forth, depending on the number of attached monomers. There are five types of heavy chains: γ, δ, α, μ, and ε. They define the classes of immunoglobulins. Heavy chains α and γ have approximately 450 amino acids, while μ and ε have approximately 550 amino acids. Each heavy chain has a constant region, which is the same in all immunoglobulins of the same class, and a variable region, which differs between immunoglobulins of different B cells, but is the same for all immunoglobulins produced by the same B cell. Heavy chains γ, α, and δ have the constant region composed of three structural domains; the constant region of heavy chains μ and ε is composed of four domains. The variable domain of any heavy chain is composed of one domain. These domains are about 110 amino acids long. There are also some amino acids between constant domains. Only two types of light chains exist: λ and κ. In humans, they are similar with only one type present in an individual antibody. Each light chain has two successive domains: one constant and one variable. The approximate length of a light chain is from 211 to 217 amino acids. The ratio of kappa (κ) to lambda (λ) varies by species (Sigma-Aldrich 2006). In humans, the ratio is 67 percent kappa and 37 percent lambda. Other ratios of kappa to lambda are mouse (99 percent kappa, though 95 percent has also been reported), horse (1 percent kappa), pig (50 percent kappa), and sheep (1 percent kappa) (Sigma-Aldrich 2006). Together, the two heavy and two light chains of the "Y"-shaped monomer form six to eight constant domains and four variable domains. Each half of the forked end of the "Y" is called a Fab fragment. It is composed of one constant and one variable domain of each of the heavy and the light chain, which together shape the antigen-binding site at the N-terminal end of the monomer. The two variable domains bind their specific antigens. The enzyme papain cleaves a monomer into two Fab (fragment antigen binding) fragments and an Fc (fragment crystallizable) fragment. The enzyme pepsin cleaves below the hinge region. The Fab fragments are often referred to as the arms of the monomer, while the Fc region is known as the stem. The antibodies in an organism can bind a wide variety of foreign antigens. Somatic recombination events, in which genes are selected (variable (V), diversity (D), and joining (J) for heavy chains, and only V and J for light chains) to form countless combinations, generate this diversity. The main reason the human immune system is capable of binding so many antigens is the variable region of the heavy chain. To be specific, it is the area where these V, D, and J genes are found, otherwise known as the complementarity determining region 3' (CDR3). 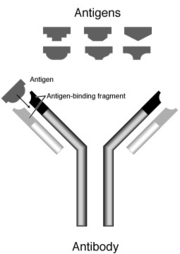 The Fc fragment, the stem of the "Y," is composed of two heavy chains that each contribute two to three constant domains, depending on the class of the antibody. Fc binds to various cell receptors and complement proteins. In this way, it mediates different physiological effects of antibodies, such as opsonization, cell lysis, mast cell, basophil and eosinophil degranulation, and other processes. The variable regions of the heavy and light chains can be fused together to form a single chain variable fragment, or scFv, which retains the original specificity of the parent immunoglobulin. A crude estimation of immunoglobulin levels can be made through protein electrophoresis. In this process, the plasma proteins are separated, according to weight, into albumin, alpha-globulins 1 and 2, beta-globulins 1 and 2, and gamma-globulins. Immunoglobulins are all found in the gamma region. In myeloma, where cells of the bone marrow form a malignant tumor, and some other disease states, a very high concentration of one particular immunoglobulin will show up as a monoclonal band. According to differences in their heavy chain constant domains (γ, α, μ, δ, and ε), immunoglobulins are grouped into five classes, or isotypes: IgG, IgA, IgM, IgD, and IgE. Ig is short for immunoglobulin. (The isotypes are also defined with light chains, but they do not define classes, so they are often neglected.) Other immune cells partner with antibodies to eliminate pathogens depending on which IgG, IgA, IgM, IgD, and IgE constant binding domain receptors it can express on its surface. These are the five main immunoglobin (Ig) classes, but birds also produce IgY in egg yolks (Sigma-Aldrich 2006). The antibodies that a single B lymphocyte (B cell) produces can differ in their heavy chain, and the B cell often expresses different classes of antibodies at the same time. However, they are identical in their specificity for antigen, conferred by their variable region. To achieve the large number of specificities the body needs to protect itself against many different foreign antigens, it must produce millions of B lymphoyctes. It is important to note that in order to produce such a diversity of antigen binding sites with a separate gene for each possible antigen, the immune system would require many more genes than exist in the genome. Instead, as Susumu Tonegawa showed in 1976, portions of the genome in B lymphocytes can recombine to form all the variation seen in the antibodies and more. Tonegawa won the Nobel Prize in Physiology or Medicine in 1987 for his discovery. Two characteristics used to describe antibodies are affinity and avidity. Affinity is the binding strength of the antibody to the antigen, whereas avidity is the number of antigen binding sites. For example, IgG has higher affinity than IgM, but IgM has higher avidity due to its polymer structure. IgG is a monomeric immunoglobulin, built of two heavy chains γ and two light chains. Each molecule has two antigen binding sites. It is the most abundant immunoglobulin (75 percent of the plasma antibody in adults) and is approximately equally distributed in blood and in tissue liquids. IgG is the only isotype that can pass through the placenta, thereby providing protection to the fetus in its first weeks of life before its own immune system has developed. IgG can bind to many kinds of pathogens, like viruses, bacterium, and fungi. It protects the body against such pathogens by complement activation, opsonization for phagocytosis (engulfing and absorbing of waste materials), and neutralization of their toxins. Complement activation, which is a classic pathway, results in the formation of membrane attack complexes’’ that insert themselves into the cell membranes of pathogens. This leads to the formation of pores, which allow ions to enter the cell with water following osmotically. Eventually, the cell lyses due to swelling (Silverthorn 2004). There are 4 subclasses of IgG: IgG1 (66%), IgG2 (23%), IgG3 (7%), and IgG4 (4%). IgG1, IgG3 and IgG4 cross the placenta easily. IgG3 is the most effective complement activator, followed by IgG1 and then IgG2. IgG4 does not activate complement. IgG1 and IgG3 bind with high affinity to Fc receptors on phagocytic cells. IgG4 has intermediate affinity and IgG2 affinity is extremely low. IgA represents about 15 percent to 20 percent of immunoglobulins in the blood; however, it is primarily found in external secretions of the body (Silverthorn 2004). It is secreted across the mucosal tract into the stomach and intestines and is also found in tears, saliva, and maternal milk. IgA immunoglobulin helps to fight against pathogens that contact the body surface, are ingested, or are inhaled. It does not activate complement, but does weakly activate opsonins, which are proteins that coat pathogens and make them more visible targets to the immune system. The heavy chains of IgA are of the type α. The immunoglobulin exists in two forms, IgA1 (90 percent) and IgA2 (10 percent), both which differ in structure. IgA1 is composed like other proteins; however, in IgA2 the heavy and light chains are not linked with disulfide bonds, but rather with noncovalent bonds. Though IgA2 is found less in blood serum, it accounts for major secretory antibody. The IgA found in secretions have a special form. They are dimeric molecules linked by two additional chains. One of these chains is the J chain (from join), which is a polypeptide of molecular mass 1,5 kD and is rich with cysteine. It is structurally completely different from other immunoglobulin chains. This chain is formed in the antibody-secreting cells. The dimeric form of IgA in the outer secretions also has a polypeptide of the same molecular mass (1,5 kD) called the secretory chain and is produced by epithelial cells. It is also possible to find trimeric and even tetrameric IgA. Decreased or absent IgA, termed selective IgA deficiency, can be a clinically significant immunodeficiency, or inability to develop a normal immune response. IgM is associated with the antibodies that react to blood group antigens and is therefore involved in the primary immune response. The primary immune response occurs when the body is exposed to a certain pathogen for the first time. In germ line cells, the gene segment encoding the μ constant region of the heavy chain is positioned first among other constant region gene segments. For this reason, IgM is the first immunoglobulin expressed by mature B cells. Structurally, IgM forms polymers, where multiple immunoglobulins are covalently linked together with disulfide bonds, normally as a pentamer or occasionally as a hexamer. It has a large molecular mass of approximately 900 kD (in its pentamer form). The J chain is attached to most pentamers, while hexamers do not possess the J chain due to space constraints in the complex. Because each monomer has two antigen binding sites, an IgM has 10 total binding sites; however, it cannot bind 10 antigens at the same time because of hinderance between the individual antigens. Because IgM is a large molecule, it cannot diffuse well and is found in very low quantities in the interstitium. IgM is primarily found in serum; however, because of the J chain, it is also important as a secretory immunoglobulin. IgD makes up about 1 percent of proteins in the plasma membranes of mature naive B-lymphocytes, which are cells that have yet to encounter antigen. IgD is coexpressed with IgM and is consequently also found in very small amounts in serum. It is monomeric and incorporates the δ heavy chain in its structure. IgD's function is currently unknown. It may function as a regulatory antigen receptor. Mice lacking IgD seem to retain normal immune responses implying redundancy if not lack of function. IgD ceases to be expressed in activated B-lymphocytes. IgE is a monomeric immunoglobulin with the heavy chain ε. It contains a high proportion of carbohydrates and has a molecular mass is 190 kD. It can be found on the surface of the plasma membrane of basophils and mast cells of connective tissue, both types of white blood cells. The IgE antibodies are also present in outer excretions. IgE plays a role in immediate hypersensitivity and allergeric reactions. When IgE combines with with mast cell receptors and antigen, mast cell degranulation results with the release of histamine. IgE also helps with defense against parasites, such as worms. It does not activate complement and is the only isotype that is heat labile, or constantly undergoing change and instability. Detection of particular antibodies, which can be accomplished through blood tests, is a very common form of medical diagnostics. Serology, which looks at the characteristics of a disease through the study of blood serums, depends on these methods. In some cases, the immune system fails to recognize the body as self and attacks its own components. Such autoimmune disorders can often be traced to antibodies that bind the body's own epitopes. An epitope, also known as a determinant, is a region of the surface of an antigen that can cause an immune response as well as bind with the antibody to counter that response. In the case of autoimmune disorders, the signals from the body itself are misidentified as foreign antigens. Antibodies directed against red blood cell surface antigens in immune mediated hemolytic anemia can be detected with the Coombs test. The Coombs test is used for antibody screening in blood transfusion preparation and also for antibody screening in antenatal women. "Designed" monoclonal antibody therapy is already being employed in a number of diseases, including rheumatoid arthritis and in some forms of cancer. As of 2005, many antibody-related therapies were undergoing extensive clinical trials for use in practice. Antibodies are commonly used to protect patients from rabies and hepatitis B after exposure. In biochemistry, antibodies are used for immunological identification of proteins, using the Western blot method. In this method, gel electrophoresis is used to separate denatured proteins by mass. The proteins are then transferred out of the gel and onto a membrane (typically nitrocellulose), where they are "probed" using antibodies specific to the protein. As a result, researchers can examine the amount of protein in a given sample and compare levels between several groups. A similar technique is used in ELISPOT and ELISA (enzyme-linked immunoabsorbent assay) assays in which detection antibodies are used to detect cell secretions such as cytokines or antibodies. Antibodies are also used to separate proteins (and anything bound to them) from the other molecules in a cell lysate (contents released from a lysed cell). These purified antibodies are often produced by injecting the antigen into a small mammal, such as a mouse or rabbit. Sometimes, in order to obtain large quantity of antibodies, goats, sheep, or horses are used. Blood isolated from these animals contains polyclonal antibodies, which are multiple antibodies that stick to the same antigen. The serum, also known as the antiserum, because it now contains the desired antibodies, is commonly purified with Protein A/G purification or antigen affinity chromatography. If the lymphocytes (white blood cells) that produce the antibodies can be isolated and immortalized, then a monoclonal antibody can be obtained. Antibodies also are widely used in immunohistochemical staining, which is used for the detection of proteins within the context of the tissue in which the protein is found. Sigma-Aldrich. 2006. Antibody explorer. http://www.sigmaaldrich.com/Area_of_Interest/Life_Science/Antibody_Explorer/Technical_Support/Antibody_Basics.html (accessed June 20, 2006). This page was last modified on 3 April 2008, at 17:43.